When I was at the FoodBuzz festival back in November I had something that was life-changingly good. It is called porchetta. 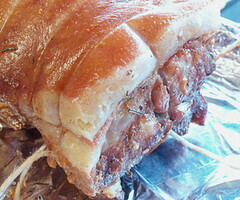 Porchetta is a pork shoulder with the fat and skin attached. 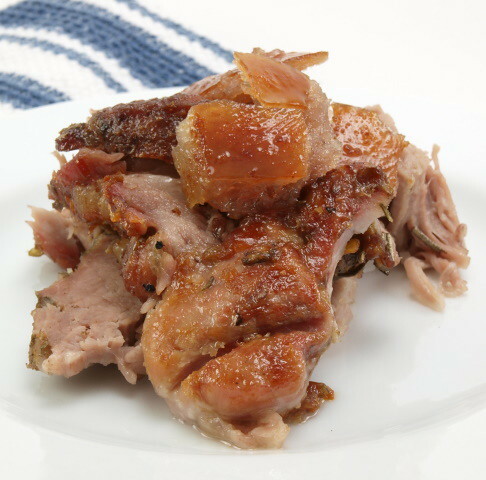 It is slowly cooked so the skin becomes crunchy while the meat becomes ridiculously tender. 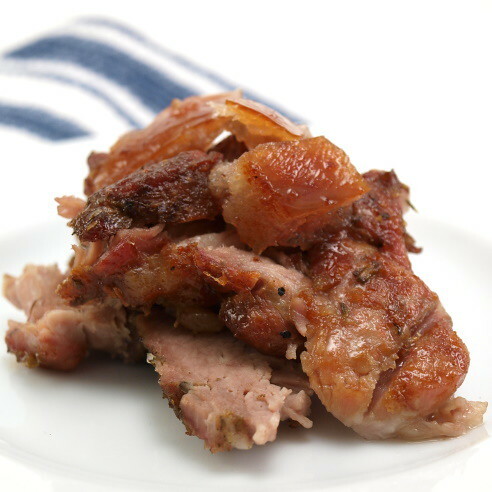 The skin, attached to the fat cap, is easily removed after the porchetta finishes cooking and I like to chop it into small pieces to garnish the meat. Believe me, the crunchy skin mixed with the tender meat really works! 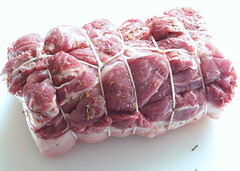 I cooked my porchetta on a rotisserie on our grill, but you can roast this in the oven and get lovely results. 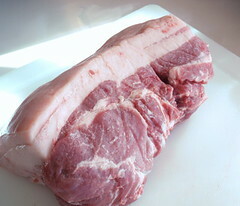 Just be sure to roast it on a rack about the pan so the fat that renders out will not make the meat soggy and greasy. 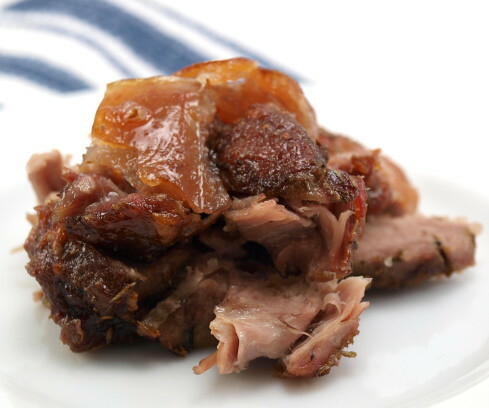 It is difficult to find pork shoulders that have not been trimmed of the fat and skin in regular grocery stores, but if you live near an Asian market you should be able to find one there. Otherwise, ask your butcher if they can special order you one. 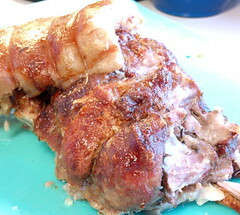 1 – 4 pound pork shoulder with the skin and fat cap attached. Heat your rotisserie to 350 F, or heat your oven to 350 F and place a rack over a roasting pan covered in foil. 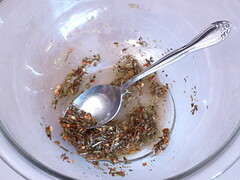 In a small bowl combine the rosemary, thyme, sage, red pepper flakes, oregano, and olive oil until it forms a paste. Set aside. On a cutting board butterfly the pork shoulder. Spread the herb paste over the meat and then fold the meat back in. Use the butchers twine to truss the roast and place on the roasting spit, or on the rack, skin side up, on the prepared pan. Roast until the meat reaches at least 180 F and the skin on top of the fat cap is hard when tapped, about 3 1/2 to 4 hours. Allow to rest ten minutes. 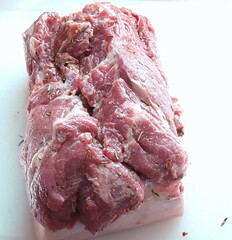 Once rested gently pull the skin off the fat cap (it should easily release) and chop into small pieces. Slice off the remaining fat, then slice the meat. 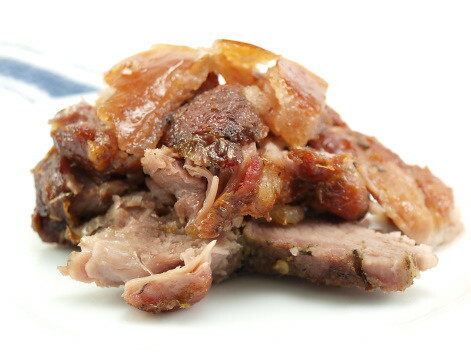 Serve the meat garnished with the crunchy skin. Enjoy!